Where, Oh Where Did My Shotshell Pattern Go? It is hard to get past the oft-repeated notion of a “better pattern.” You've heard it countless times: a shotgun, a shotshell, a choke, or a bore diameter patterns “better.” It may pattern “great” or “really good” or whatever meaningless adjectives are thrown in. Dinky shot sizes often look like they pattern well, because there are so many of them. Yet, a bunch of holes in a piece of paper has nothing to do with pattern efficiency. One ounce of #9 lead is about 585 pellets. Use #7-1/2 shot, 350 pellets, over 40% of your pattern is gone before it ever leaves the muzzle. Things look sad in a hurry when you consider #2 steel at only 125 pellets per ounce. 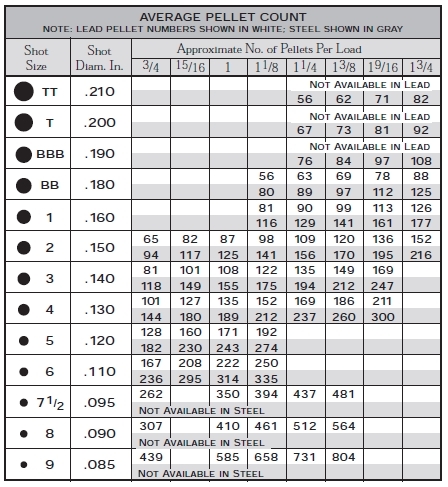 You've got less than 22% of a pattern to work with compared to an ounce of #9 lead. Naturally, it does look weak and that is why hunters like to use smaller shot than they should. Number 6 shot can be a miserable wild pheasant crippler at 45 yards, sometimes along the lines of "coyotes have to eat, too." It doesn't break bones or penetrate like #5 shot. Sometimes, it gets used because the 222 pellets in an ounce of #6 just plain looks better than the 171 pellets in a #5 lead load. It certainly does, for the #5 pattern can only be about 77% of the one ounce pattern of #6. With #4 shot, all of a sudden we have only 135 pellets: roughly 60% of the pellet count of #6. It is hard to look at a patterning board at 45 yards and decide what 40% of those pellets we really don't want. It gets worse with steel. There has yet to be any scientific study comparing lead on wild pheasants or lead on pheasants at all. An older study was by Tom Roster, using only 1 oz. steel and pen-raised pheasants. 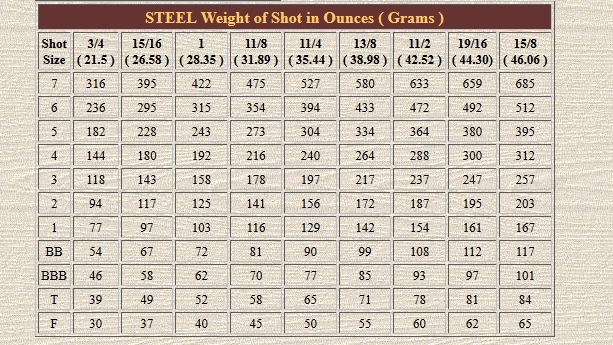 In that test, #2 steel came out on top, with its 125 pellets: it sure doesn't look like much of a pattern at 40 yards. When you consider 125 pellets vs. the 212 or so pellets in a 1-1/4 oz. load of #5 lead, it isn't a surprise. Although dinky pellets may look better on paper, you'll get quicker, cleaner kills at longer ranges by using a notch larger pellet diameter more than any other factor.